With a broad scope of 3D scanning technologies, we offer you the perfect technology solution for delivering precise digital 3D models and CAD assemblies of physical objects for use in design, engineering and manufacturing. Our 3D scanners and software for reverse engineering and inspection makes the process of digitally representing the physical world a fast, easy and accurate experience. As the originator of 3D printing and a shaper of future 3D solutions, 3D Systems enables professionals and companies to optimize designs, transform workflows, bring innovative products to market and drive new business models. Artec 3D is a global leader in 3D scanning technology, providing the best and most comprehensive 3D scanners and post-processing software applicable in a wide range of industries. Artec scanners can be used absolutely anywhere to ensure a smooth capturing process without having to relocate objects to a particular place. 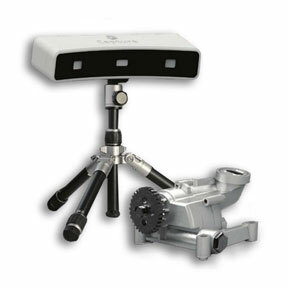 Artec Eva White-light 3D scanner for fast, accurate scanning. Great for capturing all kinds of medium sized objects such as a motorcycle exhaust system, the human body or furniture. Artec Leo Our fastest professional handheld 3D scanner yet. Encompassing the latest technologies in data capture, transfer and processing, this untethered 3D solution will revolutionize your workflow. Artec Space Spider High precision, portable metrological 3D scanning solution based on blue-light technology, perfect for capturing small objects with intricate details, such as a cylinder head, coins or a human ear. 3D Systems' industry-leading reverse engineering and inspection software tools offer the best in CAD interoperability for your 3D data; fast, accurate interpolation of input data; and time-saving tools for creating the best data possible. Geomagic Control X Comprehensive metrology software platform that delivers the industry’s most powerful tools within straightforward workflows. Quality managers are enabled with revolutionary ease-of-use, intuitive, comprehensive controls and traceable, repeatable workflows for the quality measurement process. Access a D3 specialist who can provide product expertise, a deep understanding of your industry, and value that extends beyond your software. To inquire about purchasing a 3D scanner and/or 3D scanning software, contact D3 using the form at the bottom of this page, or call Barbara Miller-Webb at 877-731-7171 ext. 301.